I only directed one show in the Valley, the 1978 production of Brigadoon at Scottsdale Community Players. My leading man was Richard Fink. He was a tall, extremely handsome guy that had the women in the cast drooling. He also sang the hell out of the Lerner and Loewe score. I wasn’t surprised to watch his subsequent career turn him into a internationally renowned operatic baritone. We likely will never see Richard on a Valley stage again – at least not in a musical comedy role – but it was a great pleasure to watch him bring audiences to their feet when we did. For his biography and a link to his website, scroll to the bottom of the page. 1978 “Brigadoon,” Scottsdale Community Players. Director: Kyle Lawson. Choreographer: Lesley Collis. Music Director: Joshua Missal. Cast: Richard Fink, Marlene Saens, Paty Lombard, Jerry Hansen, Noel Irick, Larry Collis, Sheldon Simon, Hillary Hirsch, Mark Henle, Margie Ghigo, Jim Servis. 1980 (?) “Destry Rides Again.” Phoenix Little Theatre. 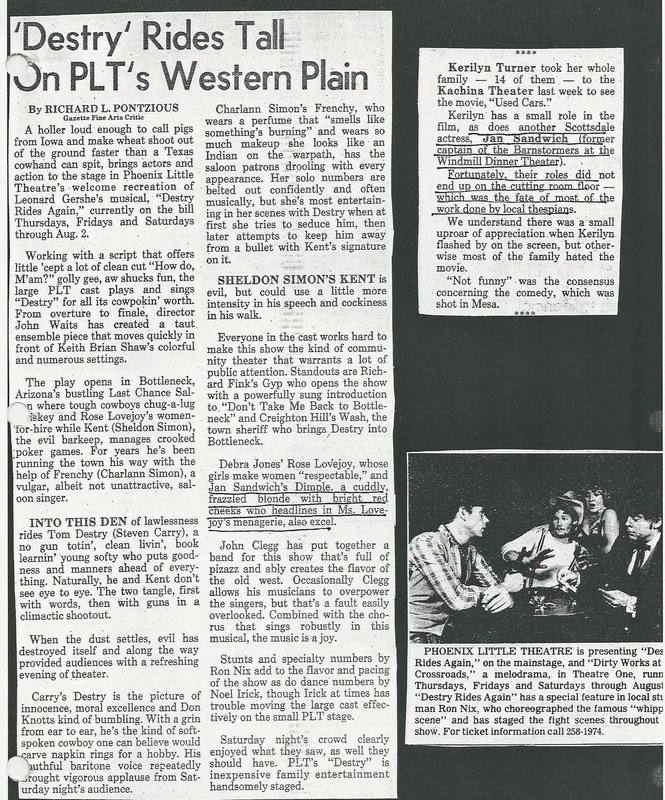 “Destry Rides Again” was produced at Phoenix Little Theatre in 1980 (?) Clippings from the collection of Jan Sandwich. Richard Paul Fink has been acclaimed internationally as a leading dramatic baritone in appearances with theaters which have included the Metropolitan Opera, Deutsche Oper Berlin, Berlin State Opera, Opera National de Paris, San Francisco Opera, Houston Grand Opera, Washington National Opera, San Diego Opera, Hamburg State Opera, Welsh National Opera, Scottish Opera, Theatre du Capitole in Toulouse, and Sydney Opera as well as at the Bregenz and Ravinia Festivals. His repertoire comprises some of the most challenging roles of the baritone canon such as the title role in Wagner’s Der fliegende Holländer, Telramund in Wagner’s Lohengrin, Pizarro in Beethoven’s Fidelio, the title roles in Verdi’s Nabucco and Rigoletto, as well as Iago in Otello, Scarpia in Puccini’s Tosca, Gerard in Giordano’s Andrea Chenier and many others. Mr. Fink has been especially identified with the role of Alberich in Wagner’s Ring cycle, which he has sung in many cycles at the Metropolitan Opera under James Levine. He sang his first performances of this role for the Dallas Opera and was subsequently invited to perform Alberich in 2000 for the world renowned Seattle Opera Ring cycle and for the Canadian Opera Company’s new Ring cycle in season 2006/07. He has been highly praised as Klingsor in Wagner’s Parsifal, a role has sung under some of the most famous conductors of our day such as James Levine, Claudio Abbado, Christoph Eschenbach, James Conlon and Valery Gergiev. Mr. Fink has participated in two very prestigious world premieres; appearing in John Harbison’s The Great Gatsby at the Metropolitan Opera under James Levine and in John Adam’s Dr. Atomic at the San Francisco Opera under Donald Runnicles. He also starred in the European and Chicago premieres of the same work. Mr. Fink began his 2009/10 season as Alberich in the Seattle Opera’s production of the Ring. He then appeared as Telramund in a new production of Lohengrin at the Houston Grand Opera. He will make his debut at LA Opera as Alberich in their three complete cycles of the Ring and will return to the Metropolitan Opera in this role in the 2010/11 season. He will also appear in the Metropolitan Opera’s premiere of John Adam’s Nixon in China. In the summer of 2011, Mr. Fink will sing his first performances of the title role of Alban Berg’s Wozzeck at the Santa Fe Opera Festival. Richard Paul Fink sang Amonasro in Aida at the Seattle Opera in the summer of 2008. In the course of the 2008/09 season, he returned to the Metropolitan Opera as Teller in Dr. Atomic and as Alberich in the Ring under James Levine and to the Canadian Opera Company as the Water Sprite in Dvorak’s Rusalka. During the 2007/08 season Mr. Fink sang Kurwenal in Tristan und Isolde at the Metropolitan Opera. He made his Chicago Lyric Opera debut in their presentation of Dr. Atomic and returned to San Francisco as Alberich in Francesca Zambello’s new production of Das Rheingold, conducted by Donald Runnicles. Other recent projects have three Ring cycles at the Canadian Opera Company’s new opera house in Toronto and two cycles at the Deutsche Oper Berlin. Mr. Fink also made his debut at the Teatro Comunale in Bologna in a new staging of Stravinsky’s The Rake’s Progress under Daniele Gatti and at the Netherlands Opera in the European premiere of Dr. Atomic. Richard Paul Fink began his professional career with the Houston Grand Opera where he participated in twelve productions and won particular acclaim as Telramund in Wagner’s Lohengrin, Jokanaan in Salome, the Water Sprite in Dvorak’s Rusalka and as Klingsor in a new production of Parsifal staged by Robert Wilson. He was soon a frequently invited guest heard in many other theaters throughout North America such as the Dallas Opera, Miami Opera, Canadian Opera Company, Portland Opera, San Diego Opera, Tulsa Opera, Opera Theater of St. Louis, Boston Opera, Vancouver Opera, Opera Omaha, L’Opera de Montreal and many others. He made his Washington Opera debut in a revival of a rarely heard work, d’Albert’s Tiefland, and returned subsequently as Orest in Elektra. He made his debut in San Francisco as Escamillo. Mr. Fink made his Metropolitan Opera debut in the 1997/98 season as Telramund in the new production of Lohengrin under James Levine and has returned subsequently in many roles which have included Kurwenal in the new production of Tristan und Isolde, George Osborne in the world premiere of The Great Gatsby, Klingsor in Parsifal and as Alberich in the Ring, (all conducted by James Levine), as well as Abimelech in Samson et Dalila, Shakolovitzky in Khovanshchina and Don Pizarro in Fidelio. Many of his other performances in North America have been in the cornerstones of the Italian repertoire. He has been heard as Carlo Gerard in Andrea Chenier at the Seattle Opera and Opera Company of Philadelphia, as Scarpia with the Dallas Opera, and as Barnaba in La Gioconda in Miami and Montreal. Mr. Fink sang his first Macbeth for Opera Pacific in 2000 and later repeated the role at the New York City Opera. 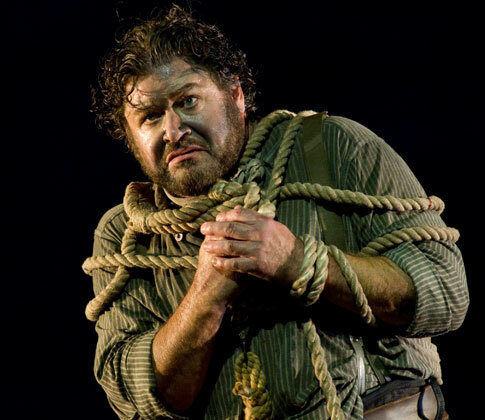 He sang his first Iago in Verdi’s Otello at the Miami Opera and debuted as Rigoletto for L’Opera de Montreal in 2003. Mr. Fink sang his first Eugene Onegin for the Atlanta Opera. In the 2004/2005 season, Mr. Fink made his debut at the Teatro Real in Madrid as Telramund in Lohengrin and at the Teatro Regio in Trieste in his first Nick Shadow in Stravinsky’s The Rake’s Progress. He was also heard at the Teatro Municipal in Santiago, Chile, in the title role of Der fliegende Holländer, as the Four Villains in Les Contes d’Hoffmann at the New Orleans Opera and as both Alfio and Tonio in Tulsa Opera’s production of Cavalleria Rusticana and Pagliacci. In the summer of 2005, Mr. Fink starred as Alberich in the Seattle Opera’s Ring. He returned to the Metropolitan in the 2005/2006 season as Telramund and to Toronto as Alberich in Götterdämmerung. He was also heard as Scarpia for Opera Pacific. Richard Paul Fink’s first international appearances included several new productions at the Welsh National Opera of Tristan und Isolde, Der Freischütz, Carmen and Rigoletto. He appeared in Toulouse in Il Trovatore, at the Bregenz Festival as Don Pizarro and at the Spoleto Festival in Die tote Stadt. He starred in the title role in Wagner’s Der fliegende Holländer for his debuts at the Canadian Opera, the Australian Opera and the Palacio de las Bellas Artes in Mexico City. He debuted in Leipzig in Salome and with the New Israeli Opera in Cavalleria Rusticana/Pagliacci, where he later returned as the Four Villains in Offenbach’s Les Contes d’Hoffmann. Mr. Fink made his Berlin State Opera debut in 2000 as Telramund and subsequently bowed at the Paris Opera as Klingsor, conducted by James Conlon. He was also heard in this role in 2001 with the Berlin Philharmonic under Claudio Abbado followed by performances at the Salzburg Festival in 2002 again under James Levine. Hr made his Deutsche Oper Berlin in 2003 in Der fliegende Holländer. The artist has also appeared frequently in concert with the Houston Symphony under Christoph Eschenbach and made his debut with the San Francisco Symphony in concert performances of Fidelio. He sang Stravinsky’s Oedipus Rex for the Seattle Symphony under Gerard Schwarz, Orff’s Carmina Burana at the Cincinnati May Festival under James Conlon and Verdi’s Requiem in Houston under Robert Shaw.